A recent review by Elizabeth Marshall Thomas in the February 22 London Review of Books begins by noting the fact that “the dog/human bond, for all its importance, is one of the least examined relationships in Western culture.” And indeed, though the attachment between dogs and their human companions plays an important role in the lives of millions of Americans, “dogs have never been considered an appropriate subject for serious scholarship.” Alice Kuzniar’s new book Melancholia’s Dog: Reflections on Our Animal Kinship promises to change that. Moving beyond the stereotypes that confine discussion of the dog/human relationships to “lowbrow, popular media and arts,” as LRB notes, “this is probably the first time that a scholar of Kuzniar’s ability has shown the courage to tackle the deeper aspects of our relationships with dogs.” The review continues: Our dogs are metaphors for ourselves, something that many of us may have long suspected, but because the idea had never been articulated, or not fully, perhaps we did not appreciate the fact. Or perhaps we didn’t want to face it. Thanks to Alice Kuzniar we know it now. . . . 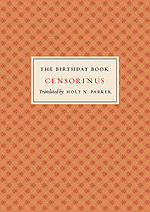 It was his birthday, so it’s fitting that Thomas Jones had a piece in the London Review of Books yesterday on The Birthday Book, Holt N. Parker’s translation of the third century Roman scholar Censorinus’ meditations on that most personal of holidays. Expanding the concept of the birthday to comment on everything from music and history, to astronomy and astrology, Censorinus’ book is a sublime picture of the universe as it was conceived by the Romans. But, as Jones notes, though the work has had significant influence on western culture, until now it has only been accessible to those who read Latin: Though this is its first translation into English, The Birthday Book enjoyed many centuries of popularity. “It has come down to us through a large number of manuscripts from as early as the beginning of the eighth century AD,” Parker says, and “was among the earliest books printed in Europe, with a first edition in 1497, and new editions in 1498 and 1500, with eight more in the 16th century alone.” Copernicus and Kepler were both familiar with it. And even if the book itself has since fallen into obscurity, its form is recognizable in such modern assemblages . . . In commemoration of the 50th anniversary of the death of conductor Arturo Toscanini, WFMT’s Critical Thinking with Andrew Patner will feature a two part conversation with Harvey Sachs, editor of The Letters of Arturo Toscanini, which we recently published in paperback. The first show airs on February 26 at 10:00 pm central time and the second on March 5 at the same time. If you’re in the Chicago area be sure to catch the show, if you’re not, WFMT offers streaming audio, but you’ll have to subscribe to listen. Fifty years after his death, Arturo Toscanini is still considered one of the greatest conductors in history, and probably the most influential. 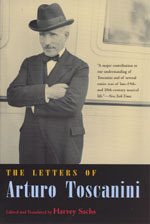 His letters, expertly collected, translated, and edited in The Letters of Arturo Toscanini, will give readers a new depth of insight into his life and work. As Sachs puts it, they “reveal above all else a man whose psychological perceptions in general and self-knowledge in particular were much more acute than most people have thought likely.” They are sure to enthrall anyone interested in learning more about one of the great lives of the twentieth century. 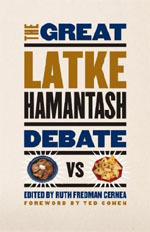 Read an excerpt. . . .
Ruth Fredman Cernea, editor of The Great Latke-Hamantash Debate, was interviewed in the February 20 edition of the Jewish Ledger, a Connecticut weekly. In her conversation with staff writer Judie Jacobson, Cernea talks about the genesis of the University of Chicago’s famous Latke-Hamantash debates, some of its notable participants, and the meaning—or lack thereof—in its annual deliberations. From the interview in the Ledger: Q: When and why did the debate get started? A: It began more than 60 years ago as an inspired “lark” by three people at the University of Chicago—Professor Sol Tax, an anthropologist; Professor Louis Gottshalk, a historian, and Rabbi Maurice Pekarsky. They were worried about the intellectual and social climate at the university for the numerous Jewish faculty and students there. This was a time when it was not professionally advisable to advertise your ethnic background on campus, when being an objective scientist meant burying the “yid” inside. In fact, many of the faculty had been brought up in homes rich in Eastern European Jewish culture: they knew Yiddish, ate the traditional East European foods, and went to “cheder.” In another world they might have become Talmudists. … The Tax-Gottshalk-Perkarsky spur-of-the-moment idea? A shmooze in the . . .
Sunday’s San Jose Mercury News carried an interesting review of an exhibit at the San Jose Museum of Art. The exhibit gathers photographs, paintings, and sculpture on the theme of suburbia—so appropriate for the heart of Silicon Valley. The Mercury News reviewer, Alan Hess, takes the exhibit to task however, and juxtaposes what he sees as typical condescending attitude towards suburban development with the insights of one of our authors, Robert Bruegmann, whose book Sprawl: A Compact History works to overturn the conventional wisdom on suburbia. Hess writes: Vacant neighborhoods, sterile landscapes, and scary people dominate the exhibit “Suburban Escape: The Art of California Sprawl,” at the San Jose Museum of Art … . But until we stop repeating these myths—and stop basing architectural and planning policies on them—suburban cities such as San Jose will never achieve their full potential. Fortunately, some serious academics are taking a fresher look at the facts. 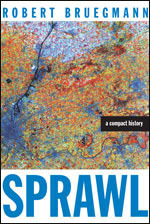 A 2005 book with the catchy title Sprawl: A Compact History, by University of Illinois Professor Robert Bruegmann is one excellent antidote to decades of flawed opinions. As it happens though, we have dogs on both sides in this fight. The catalog for the exhibition, Suburban Escape: The . . . In a December 2006 New York Times editorial (which we reprinted online), Mark C. Taylor wrote that his current manner of thinking and teaching “cultivate a faith in doubt that calls into question every certainty.” This philosophy is on elegant display in Taylor’s newest book, Mystic Bones. By combining images of weathered bones with philosophical aphorisms, Taylor refigures death in a way that allows life to be seen anew. These haunting photographs speak to themes of ruin, mortality, and ritual, and to a theology based on immanence rather than transcendence. At once a fine art book of great originality and a profound spiritual meditation, Mystic Bones is Taylor’s most personal statement yet of after-God theology. See the press release. . . .
Alice A. Kuzinar, author of Melancholia’s Dog: Reflections on Our Animal Kinship, was recently interviewed by Deborah Harper for Psychjourney, her Web site for mental health professionals and consumers. Drawing from her new book, Kuzinar discusses the philosophical and psychological significance of man’s best friend and helps to demonstrate why “dog-love can be a precious but melancholy thing.” Archived audio from the interview is available in the podcasts section of Harper’s site. 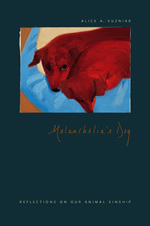 An attempt to understand human attachment to the canis familiaris in terms of reciprocity and empathy, Melancholia’s Dog tackles such difficult concepts as intimacy and kinship with dogs, the shame associated with identification with their suffering, and the reasons for the profound mourning over their deaths. 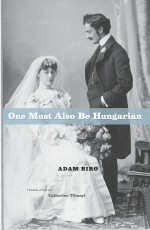 In addition to philosophy and psychoanalysis, Alice A. Kuzniar turns to the insights and images offered by the literary and visual arts—the short stories of Ivan Turgenev and Franz Kafka, the novels of J. M. Coetzee and Rebecca Brown, the photography of Sally Mann and William Wegman, and the artwork of David Hockney and Sue Coe. Without falling into sentimentality or anthropomorphization, Kuzniar honors and learns from our canine companions, above all attending the silences and sadness brought on by the effort . . .
Publishing the online edition of The Chicago Manual of Style has given us some insight into how people use electronic editions of books, an awareness of the usability issues posed by the online environment, and a renewed appreciation for the simplicity and naturalness of the physical book. Or at least the physical book seems a simple and intuitive interface. But maybe not. Maybe the first users of the codex had technical difficulties just as computer users have today. Maybe every monastery had a help desk to assist readers and scribes with recalcitrant books. Via YouTube: According to a comment on YouTube, the clip is from a show called Øystein og meg (Øystein and I) and appeared in 2001 on NRK, the Norwegian television network. The sketch was written by Knut Nærum and performed by Øystein Bache and Rune Gokstad. The spoken language in the clip is Norwegian; the subtitles are in English and Danish. . . .
Every month the manuscript editors at the Press field questions submitted to The Chicago Style Q&A, a feature of the new Chicago Manual of Style Online. Our manuscript editors respond to these questions with serious explications of the subtleties of style and usage, although they cannot resist the occasional—well, maybe more than occasional—diversion into delicious irony. This month’s Harper’s reprinted some highlights from the Q&A under the appropriately paradoxical title of “Stet Offensive,” further described on their Web site as “aggressive advice from the editors of the Chicago Manual of Style.” Here are examples of our editors’ advice: Q: When I began learning English grammar from the nuns in 1951, I was taught never to use a comma either before or after independent clauses or compound sentences. Did the rules of English grammar and punctuation change while I was in that three week coma in 1965, or in the years it took to regain my basic and intellectual functioning before I returned to teaching? A: I’m sorry I can’t account for your state of mind, but standard punctuation calls for a comma before a conjunction that joins two independent clauses unless the clauses are very short. I would go further . . .